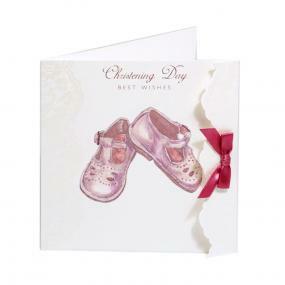 This pretty Christening card is printed with a pair of pink shoes and has a pink bow attached. The message on the front is 'Christening Day Best Wishes' and the card is blank inside. Made by Cavania the card measures 14.5cm x 15cm and is supplies with a matching envelope.